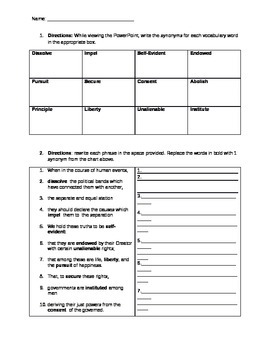 This is a set of activities that can be used to aid students in rewriting the preamble to the Declaration of Independence. This is intended to be used with my Declaration of Independence Preamble PowerPoint. There is a vocabulary pre-assessment, which can be utilized to get an idea of students prior knowledge and/or as a prediction activity. Also included is a worksheet intended to be used as an organizer for students to take notes while viewing the PowerPoint. Next, is a worksheet that guides students through rewriting the preamble. Lastly, for students who are not quite there yet, there is a set of rewritten phrases that students can match up to the phrases rather than rewriting them on their own. Great way to incorporate a primary source, literacy activities and Common core aligned. Packet contains an outline of the lesson procedure, as well as variations for differing abilities.